The publisher is adamant that an eShop-only release won't hurt the sales of the courtroom simulator. If you're a fan of spiky-haired lawyer Phoenix Wright, you may have been excited by the news that the next installment of his courtroom escapades will be localized in English. You may have been less excited by the fact that the English localization will only be available as a Nintendo eShop digital download. When users took to Capcom's unity forms to ask why, Capcom pointed the finger at retailers. 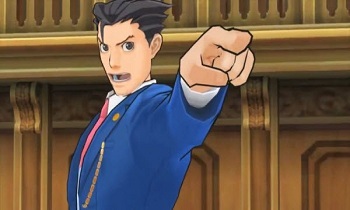 "Historically it's been tough to attract long term retail support for Ace Attorney titles ... With that in mind we have opted for a digital only release via the Nintendo 3DS eShop," said Capcom USA's Senior Vice-President Christian Svensson. When users expressed concern that the eShop's horribly un-intuitive interface may make the game's sales suffer, Svensson told us to not underestimate the power of community. "I think you're selling yourself and the AA community short. I also think you underestimate our relationship with NOA and what I hope will be our ability to keep it surfaced for more than just a few weeks." "I understand that this decision may upset fans who wanted to have a physical version of the title to add to their collection but we believe this direction is the best to take." Svensson also talked about how retail margins for games in the West are not the same as in Japan. "Not every game is appropriate for both formats given the economics involved. This is similar to Darkstalkers Resurrection or RE4 HD or Okami HD being physical in Japan, but digital in the West." He also says that this move is a sign of the times that the games business is going increasingly digital. Lastly, Svensson says that upset fans don't yet have the full story concerning Ace Attorney 5's English localization, and to just hold tight for more news. "More details will become clear in a few weeks and hopefully the method to our madness will become more clear," he writes. The Ace Attorney series was a surprise hit in the West, with the first four installments selling quite well. Unfortunately, sales for the spin-off Ace Attorney Investigations fell short of expectations, leading to Ace Attorney Investigations 2 and the recent Professor Layton/Phoenix Wright crossover game not getting an English localization. Sure, the Digital-only thing is a bit of a bummer, but it is better than nothing. As Svensson put it, "If we'd said 'no, it's not coming', it would have triggered the inevitable 'please bring it to eShop, at least' cries. Instead we shortcutted that and brought it straight to eShop."